While at the hotel, I installed the Android app “Renfe Ticket” and bought my ticket. It worked all perfectly. In order not to miss the train, I had to go and by a second ticket from the cashier and then rush back to board the train. I then experimented a bit. And here’s what I found out. Same problem happens when I try to check expected arrival time for the commuter train: the app Renfe Cercanias isn’t able to give me any information while I’m using my Swedish mobile internet connection. So: When European Union strives to unite its member states into one large country (telecom-wise), RENFE is going in opposite direction, making sure that ONLY Spanish mobile numbers should be served in their apps. A few weeks ago “Thirst”, the newest book by Jo Nesbø, was released in Swedish. (It will be realeased in English tomorrow.) I wanted to buy it and found that one of the best prices was offered by www.signon.se. By the way, if it wasn’t for a direct link from pricerunner.se, I’d never found the book on their site, since their internal search logic is really bad. They state that you can search on title, author, publisher, etc., but in reality you can only search for any single one of these arguments. And you must get a 100% match. Try typing “Jo Nesbø” without Norwegian or Danish keyboard layout! So I added the book to my order and went to check-out. First I would had to register. And this is were things went awkward. Obviously, the site uses https, so the communication between my browser and their server is encrypted. But what do they do with my data? Firstly: The password I created for this website was e-mailed back to me! To me, this an obvious signal that their whole thinking around security is flawed. It’s quite possible that they store my password in clear in their database, which is insecure practice. Almost all current frameworks know to instead store hash values that are created using individual salt strings and cryptography, and never ever send e-mails with the password in clear. The industry practice is to only send one-time nonce-values upon request that then are used to allow password to be reset if lost or forgotten. Secondly: The account was immediately activated without any verification of my e-mail address. With a simple script you could start stuffing their database with fake accounts and even have them automatically send out confirmation emails as spam, possibly with insulting passwords written in clear! Next, I went to the beautiful check-out page, which proudly shows off a DIBS logo. Would I trust DIBS with my credit card details? Yes, they’re OK. But would I trust signon.se with my details? No, not really. So I had a quick look at the code behind the page. The form was programmed to deliver my credit card details to their own server. That helped me make my final decision. End of story: I decided to pay about one euro more, but to a different vendor. First of all, a big “Thank you” to those of you, who have contributed and continues to contribute in making WordPress available in various languages, including Swedish. All translation of WordPress core, and most translations of plugins and themes are handled via the online platform GlotPress. Anyone is welcome to take part in this work. You just need to register a free account at www.wordpress.org, and then you may head over to https://translate.wordpress.org/ and start translating! However, one important task for us, is to create and maintain a consistent user experience for a localized (i.e. translated) WordPress. One important tool for this is the glossary, where we have collected useful comments on specific words and phrases and in many cases give the specific term we’ve chosen to use. One example: The English word “shortcode” might be translated into Swedish in various ways, and we’ve simply chosen the word “kortkod” for this term. If you’ve been translating anything for WordPress core, then you may have seen translated terms and comments automatically show up in the translator view. 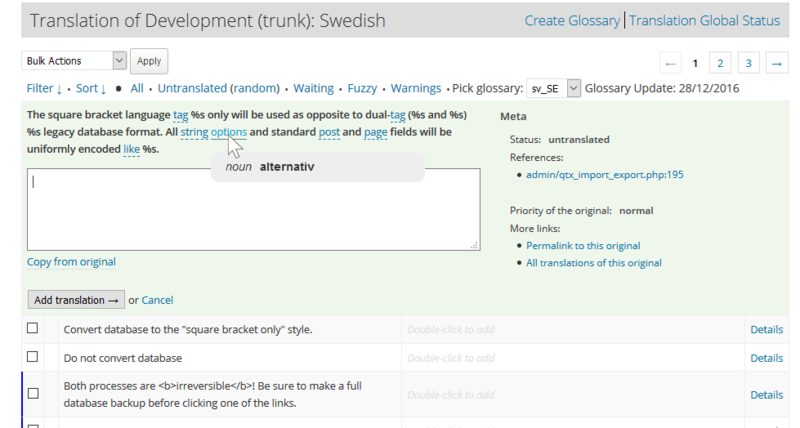 In a future version of GlotPress we may expect these useful hints to show up during translations of any plugin or theme. But in the meantime, I’d like to tell you about a very useful tool, which will “inject” translator hints in these other projects already today. Whatever you do, never activate your Trados Studio 2017 before trial period has ended! I just discovered a weird bug in Trados Studio 2017, and it may cost me 1-2 working days! I started using Trados Studio 2017 (and got it in trial mode mid November 2016. On December 14, when some 2-3 days remained of the trial period I decided to activate my copy. Everything worked fine. Since my license was for the “Starter” edition, I had to choose 5 languages I want to work with, but that’s OK.
Today I needed to work, so I started the program. And it tells me: License expired! My online account at SDL, though, still shows that I got one license, which was activated on Dec 14. 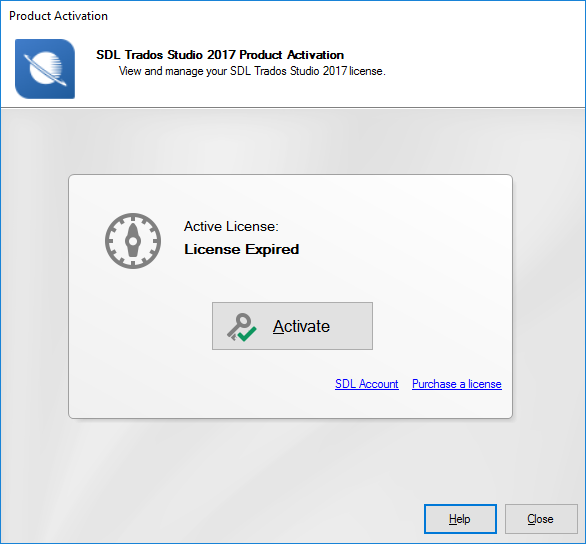 Therefore I’m not allowed to reactivate with the same code, on the same computer, since that license is “already in use” according to SDL. I’ve filed a ticket to SDL, this may cost me 1-2 days, since I haven’t paid for premium support. I spent several hours this morning trying to figure out why it didn’t work. Solution: Yes, I found the solution. In my case it was almost embarrassing. 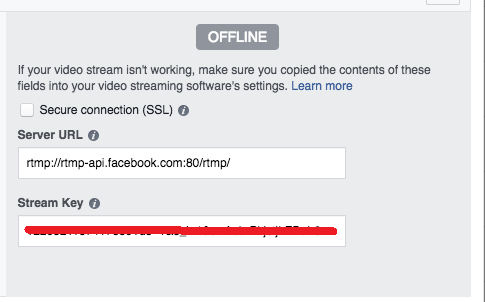 After I tried streaming to youtube and everything worked spot-on, I went back to another try again with facebook. But this time I noted a small banner at the top of my browser window. 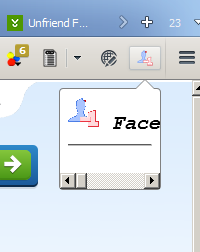 It turned out I was blocking some flash player content on the page. As soon as I clicked on “allow”, the OFFLINE message vanished and I could see my preview. Now and then, I answer some questions over at Yahoo answers. Today, I noted an interesting thing. One of my answers suddenly had -1 comments! How could this ever happen? Well, I happen to know half of the story, so I can make up at least of part of the rest. There was one comment there. Then I responded to the first comment, but made a typo, so I posted again, now without the type. At this point there were three comments. But I could really live without the second one, with my typo. And, guess what, when I hovered over the comment, a little button with an X appeared. I clicked on it, but nothing happened. So I clicked again a few times. My comment was still visible. I figured it might be some issue with some script not executing correctly in Firefox, so I started another broswer (chrome), logged in and went to the answer. And there it was: -1 comments! I reloaded the page in Firefox, and got -1 comment there, too. If you don’t believe me, here’s a screenshot. I’ve manually painted around the offending part! I use Firefox as my main browser. And today I noticed that unfriend finder now is available for firefox, too. So I installed it. The plugin seems to work. After a while, the plugin button showed me that there were news for me. This is just a quick note that I’m planning to run a small basic training in how to set up your own web site using WordPress. The training will be in Barcelona and will be held in Russian. More information can be found at http://kursy.fjellner.com/ Please do share this if you know anyone who might be interested. 20 minutes ago WordPress.org started rolling out a security update to several of the latest releases. By default, this update will happen automatically (automagically ;) ). But in case you have, turned off the automatic update, then this is gor you. The update fixes a whole bunch of XSS (Cross-site scripting) vulnerabilities that you WANT to plug as quickly as possible! Recently, the main activities of the Festival of Words in the small Swedish city Östhammar occured. A part of the festival was the “Poetry Street”, where quite a few short poems on the festivals theme (for the year 2014, the topic is freedom) were on display in the windows of various shops in the centre of the city. Two of my own texts are included, but since I live too far away from Östhammar to see those displays myself, I suggested that we should back up with virtual version of the Poetry street. This way, anyone can visit the exhibition, without going to Östhammar. And the exhibition will still be around when the poems are taken down in the shops physical display windows. And, finally, the internet version can be useful even to someone visiting Östhammar, since s/he has the possibility to check that no single poem on display was missed! © 2019 Tor-Björn Fjellner on GSM and IT.